SEAN: Usually I go in alphabetical order by publisher when I do this, but sometimes I need to shill, and this is one of those weeks. Urusei Yatsura is one of the seminal titles of anime and manga. It started a brilliant career for its creator, Rumiko Takahashi. Its female lead, Lum, is recognizable even by those who don’t follow anime. It was licensed here back in the 1990s, but that wasn’t the right time for it. This is. It’s coming out in 2-in-1 omnibuses, the art looks fantastic (all right, the art looks really crude and 1978, but the restoration looks fantastic), AND it’s the first Takahashi title to get a digital release in North America. I realize the early volumes can be hard to take. These aren’t likable characters. But God, they’re funny. Pick up this little slice of history. MICHELLE: I don’t expect to find this funny, but I feel like I ought to try it, at least. I do like Takahashi in general. ANNA: An important part of manga history! I’m glad it is being issued again. ASH: I’ve been wanting to read the series for a while now, but the old edition was becoming difficult to find. Glad that I’ll finally get a chance! MELINDA: I’ve never been as much of a Takahashi worshiper as I feel like I should be, but I guess this gives me another chance to try to become one. SEAN: And now back to the routine, which means Ghost Ship. We get To-Love-Ru 11-12, To-Love-Ru Darkness 9, and World’s End Harem 4. 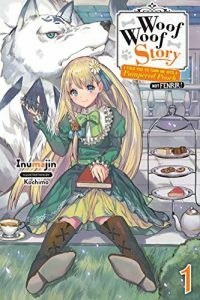 J-Novel Club has another debut next week with Welcome to Japan, Ms. Elf! A young man has dreams where he’s in a fantasy world fighting next to a beautiful young elf. One day, he wakes up… no, he’s not in the fantasy world. Instead, the elf is now in Japan. It’s Isekai Reverse! There’s also Ao Oni: Forever, An Archdemon’s Dilemma 4, and the 13th Grimgar of Fantasy and Ash. Kodansha print-wise has Fire Force 14 and Grand Blue Dreaming 4. Digitally, we debut World’s End and Apricot Jam (Sekai no Hajikko to Anzu Jam), a Dessert series about a young apartment manager who finds that one of the tenants (whose keyboard she accidentally breaks) is actually a famous musician! There’s also a pile of digital-only ongoing series. Back Street Girls 8; DAYS 12; A Kiss, for Real 7; Living Room Matsunaga-san 5; Perfect World 8; and Tokyo Revengers 4. MICHELLE: Hooray for DAYS. I think A Kiss, for Real also looks pretty cute. SEAN: One Peace Books has the 2nd Hinamatsuri. 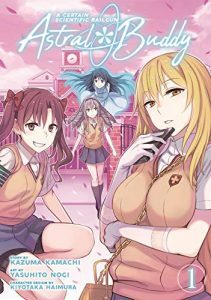 Seven Seas debuts a spinoff of a spinoff, as the Railgun manga gets its own side story, A Certain Scientific Railgun: Astral Buddy. It stars one of Misaki’s two henchwomen. There’s also the 2nd Fairy Tale Battle Royale, Freezing 23-24, a 6th Holy Corpse Riding, and the 5th Saint Seiya: Saintia Sho. Vertical has a 3rd volume of Chi’s Sweet Adventures. In addition to Urusei Yatsura (see above), Viz also gives us Mobile Suit Gundam Thunderbolt 10, Ran and the Gray World 2, the 4th and final RWBY manga anthology, and a 9th Tokyo Ghoul: re. MICHELLE: The first volume of Ran and the Gray World was pretty neat! I hope they jettison the creepy dude in volume two, though. ANNA: I have a feeling that is not going to happen, but the art really blew me away so I’m still curious about volume 2. MELINDA: I’m definitely here for the next volume of Ran and the Gray World! SEAN: And now Yen buries us in books, though as always a few titles seem to have slipped to the week after next. On the Yen On end, the debut is Woof Woof Story: I Told You to Turn Me Into a Pampered Pooch, Not Fenrir!. It’s a reincarnation isekai. And again, our hero isn’t a human. He’s a dog. A… very big dog. OK, a wolf. A VERY BIG WOLF. MICHELLE: Wow. That title is something else. ASH: Sometimes the titles and concepts are more impressive than the actual execution of the story. I wonder if that will be the case here. SEAN: There’s also A Certain Magical Index 18, The Empty Box and Zeroth Maria 5, Is It Wrong to Try to Pick Up Girls in a Dungeon: Sword Oratoria 8, the 7th My Youth Romantic Comedy Is Wrong As I Expected, the 9th Re: Zero, and a 3rd volume of Sword Art Online Alternative: Gun Gale Online. The one debut for Yen’s manga side is a spinoff: Kakegurui Twin, a prequel to the main series. Non-adaptation titles include Barakamon 17, Dimension W 13, Forbidden Scrollery 6, Gabriel Dropout 6, Girls’ Last Tour 6 (a final volume), Hatsu*Haru 5, Laid-Back Camp 5, Prison School 12, School-Live! 10, Shibuya Goldfish 3, Silver Spoon 7, Tales of Wedding Rings 5, Though You May Burn to Ash 4, Trinity Seven 15.5 (a half volume? ), and Val x Love 5. MICHELLE: More volumes to add to the Barakamon and Silver Spoon to-read piles! ANNA: I haven’t read the first couple volumes of Silver Spoon but I will one day! MELINDA: SILVER SPOON SILVER SPOON I AM NOT LISTENING TO ANNA LA LA LA. SEAN: It’s a light month for light novel adaptations, though. We see the 2nd Is It Wrong To Try To Pick Up Girls in a Dungeon: Familia Chronicle, a 9th Overlord, and the 2nd Sword Art Online: Hollow Realization. ROCK THE PLANET! 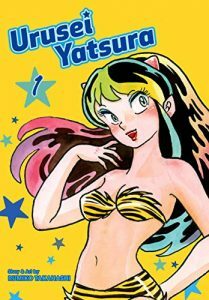 Buy Urusei Yatsura! And what else?